iPhone, Android and iPad users can now access FeralGoatScan and record feral goat data much more quicky while in the field. The new Mobile Mapping Facility enables you to record sightings using your mobile phone, and examine feral goat data throughout your local area. This is a valuable addition to FeralGoatScan and can be used by farmers, NRM groups, community groups, schools and travellers. Visit www.feralscan.org.au with your mobile phone and start mapping today. 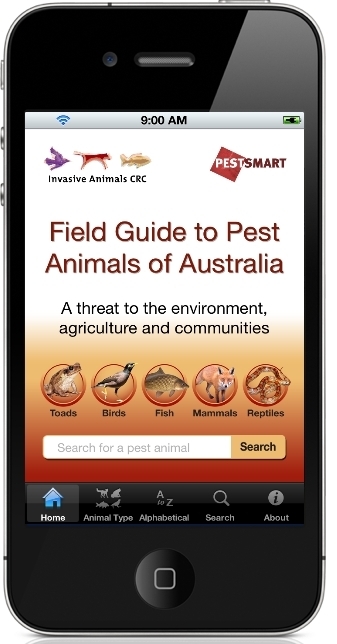 Mobile phone and iPad users can now access the latest information about Australia’s pest animals via the new Field Guide to Pest Animals App. Recently developed by the Invasive Animals CRC, this App contains species profiles for 31 of Australia’s worst pest animals, and includes species descriptions, photo galleries, footprints, audio calls, maps, control techniques, and quick links to plenty of pest control resources. Learn about the pest animals in your area with this new App. This App is a valuable education resource for community groups, schools, landholders and educators. Download the App from the Apple Store (https://itunes.apple.com/au/app/field-guide-to-pest-animals/id634197149?mt=8).